Seriously, what in life is NOT figure-out-able? I have yet to find anything that cannot be firgured out. Okay, so some of the “figuring out” is acceptance of things we cannot change, but THAT is a way of figuring out the tough stuff. Sometimes the things we cannot figure out, and have to accept, are actually the SOLUTIONS, not the problems. For example: when we are chronically ill and forced into bed and we cannot solve that problem, it is actually a solution in itself. We sometimes NEED to be in bed for a while to heal. Maybe, just maybe, it is being forced on us to teach us how to rest our bodies. How to slow down and take care of ourselves so that we can heal and learn how to sustain health. Maybe those forced upon us solutions are to help us use our minds and our brains better. The more still we get, the more we are able to do some much-needed figuring-out. We can listen to our bodies better when we are still. We can feel what each organ is doing and how well it is functioning, or not functioning, and then figure out the solution. 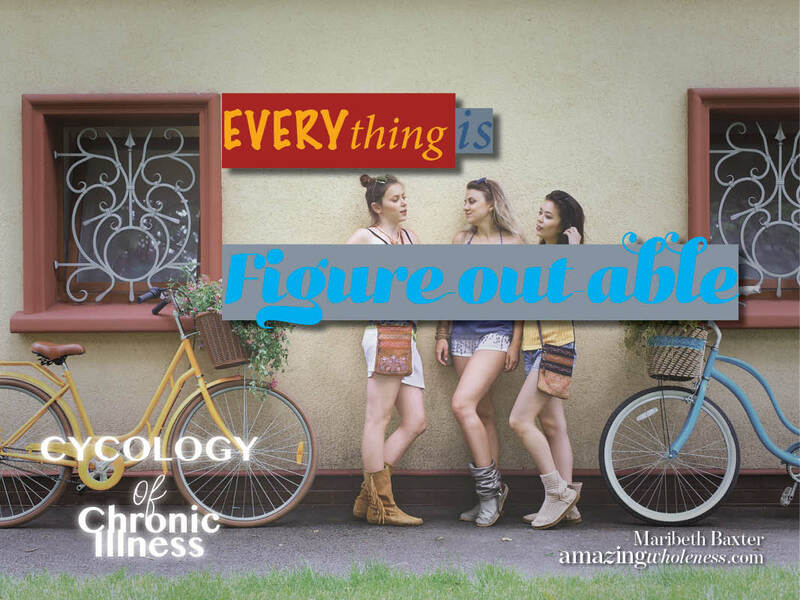 There is no “Figure-it-out Fairy” that will come along and tell you all the answers to chronic illness. It is for YOU to figure-it-out because it is VERY specific to YOUR body and YOUR circumstances. Talking to others, doctors, health coaches, groups, anyone with any insight helps YOU figure-it-out. There is no “Figure-it-out Police” that can keep you from making wise informed decisions about YOUR body and your life. I know, we live in a time when many health related choices are imposed on us, but … even they are figure-out-able. Find like-minded people: friends, family, health-care providers. Keep figuring-it-out!!!!! There are always ways to move from where you are to another place — with your health AND with your mind. Everything is figure-out-able. Next post: Have you fallen in love with essential oils yet?